Also available as an ebook from Amazon and other leading online stores. Pride and Prejudice set in the Victorian wheat belt of the 1890s. Phoeba Crupp is a gal of inconveniently independent tendencies, to the concern of her mother and her sisters although not of her father, whose mind is on his vineyard – regarded with deep suspicion by the neighbouring graziers. The economy is depressed and dangerously unemployed men roam the roads, while the nearby squatter is not as wealthy as he used to be. Like The Dressmaker, this is a dark comedy about a place that becomes stranger the longer we spend there, and confirms Ham’s reputation as one of the most original Australian novelists now at work. Rosalie Ham was born and raised in the Riverina, in southern NSW, and now lives in Brunswick, Victoria. She studied drama and literature before taking up writing seriously and has had three stage plays and one radio play performed in Melbourne. The Dressmaker was her first novel. 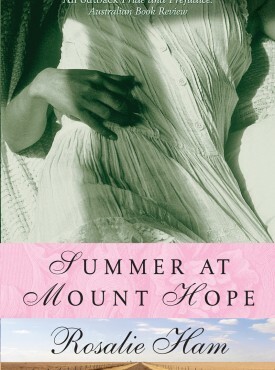 After Summer at Mount Hope (Duffy & Snellgrove) she published There Should be More Dancing (Random House).